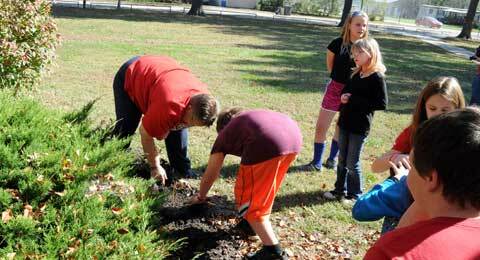 Fifth-graders at Marais des Cygnes Valley Elementary School plant tulips near the school’s entrance Monday, assisted by custodian Duane Meiers, principal Twila Wollenberg, fifth-grade teacher Peggy Burkdoll, and representatives of Drug Free Osage County. 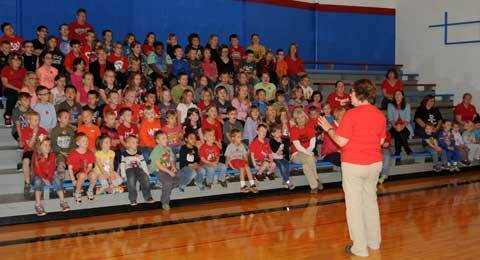 Each year, Red Ribbon Week is celebrated in schools in Osage County and across the country during the last week of October. Red Ribbon Week was established in 1988 as a way to educate youth and encourage participation in drug prevention activities, and in memory of Drug Enforcement Administration Agent Enrique Camarena, who was killed in 1985, presumably by a drug cartel. He believed that one person can make a difference in the battle against drugs. During Red Ribbon Week area schools are observing this year’s Red Ribbon Week theme “YOLO (you only live once). Be Drug Free” with assemblies, activities and school decorations. And as in past tradition, several school classes will plant red tulips around their school as a continuing reminder to “plant the promise” to stay drug-free. When the tulips come up in the spring, people are again reminded of the meaning of Red Ribbon Week. Children of parents who talk to their teens regularly about drugs are 42 percent less likely to use drugs than those who don’t; yet only a quarter of teens report having these conversations. The National Family Partnership organized the first Nationwide Red Ribbon Campaign to raise awareness about drug and substance abuse. Since its beginning in 1985, the Red Ribbon has touched the lives of millions of people around the world. Many parents and youth in communities across the country wear red ribbons as a symbol of their commitment to raise awareness of destruction caused by drugs in America. Camarena was a Drug Enforcement Administration agent who was killed in Mexico in 1985. When he decided to join the DEA, his mother tried to talk him out of it. “I’m only one person,” he told her, “but I want to make a difference.” On Feb. 7, 1985, the 37-year-old Camarena left his office to meet his wife for lunch. Five men appeared at the agent’s side and shoved him in a car. One month later, his body was found – he had been tortured to death. In honor of Camarena’s memory and his battle against illegal drugs, friends and neighbors began to wear red badges of satin. Parents, sick of the destruction of alcohol and other drugs, had begun forming coalitions. Some of these new coalitions adopted the red ribbon as a symbol of Camarena’s memory, and embraced his belief that one person can make a difference. 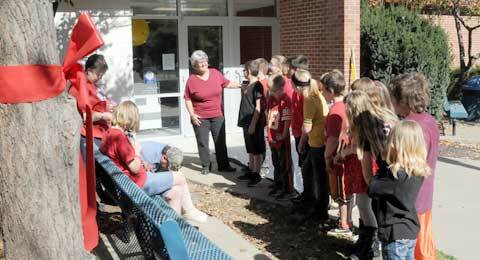 Peggy Burkdoll assists her fifth-grade students with planting tulips in front of Marais des Cygnes Valley Elementary School. Teresa Briggs, of Drug Free Osage County, tells students about the meaning of Red Ribbon Week, and urges them to avoid drugs and people who use them. Information thanks to Drug Free Osage County.